Since I’m suffering from a reading slump and I haven’t touched a book in a week, there is no book review this week. 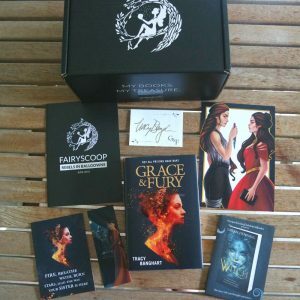 Instead, I want to share my unboxing for the Fairyloot June box. As you know, I’m a big fan of this subscription box and I’m always super excited when it arrives! The theme for June was “Rebels in Ballgowns”, and you have to admit it sounds amazing, right? So let’s dive in! 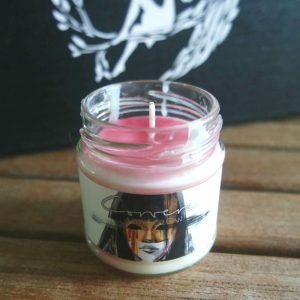 The first item was a candle by Geeky Clean. It’s called Corvere, after Mia Corvere – the main character in the Nevernight series, one of my favourite books of last year. It smells like strawberry and pepper, and the white and red colours are simply perfect for a book that is filled with stabbing and blood. Unfortunately the weather is too hot at the moment to light a candle, so I’m counting down the days till autumn! If you think your reading nook isn’t comfortable enough yet, you can use the gorgeous cushion cover that was designed by Miss Phi. It’s inspired by Legendary by Stephanie Garber and the quote reads “Your future can be whatever you wish. We all have the power to choose our own destiny”. And did you notice the tarot cards in the corners? I’ll have to order some cushion fillings soon! quote art by Stella’s Bookish Art. If you think regular rectangular bookmarks are boring, you might be interested in magnetic ones. 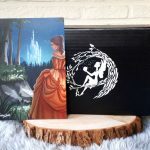 These bookmarks were designed by Taratjah – who also makes the monthly artwork for every Fairyloot box – and were inspired by the Shatter Me series. 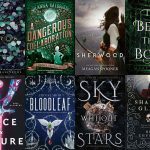 I haven’t read those books yet, but I’ve heard so many good things about it, so it’s on my TBR list! The next item is without a doubt my favourite of this box. 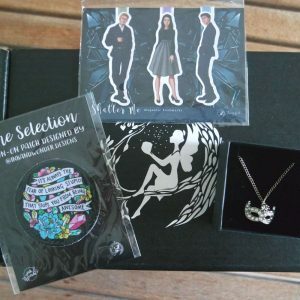 A while ago, Fairyloot asked on Instagram what we wanted to see in upcoming boxes and I suggested a necklace. So you can imagine my excitement when I found this gorgeous piece of jewelry in my box! I can’t wait to show it off! I’m personally not a big fan of iron-on patches. Not that I don’t like them, I just never use them. However, I might have to make an exception for this one because it is stunning. 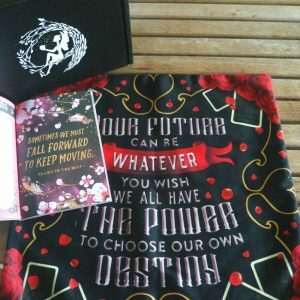 It was designed by Ink and Wonder Designs and features a quote from The Selection: “It’s always the fear of looking stupid that stops you from being awesome”. How true is that? And look at those bright colours! 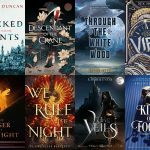 And now the book of the month… *drumroll*… is… Grace and Fury by Tracy Banghart! It’s a fantasy story about two fierce sisters. And of course a rebellion and a ball! 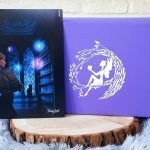 The standard UK edition of this book is paperback, but Fairyloot got an exclusive hardcover edition for us! Even more amazing: this book won’t be released until the end of July, so we got it almost a month early! 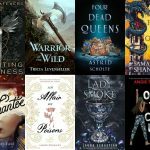 It’s one of my most anticipated releases for July and I’m really excited about it. 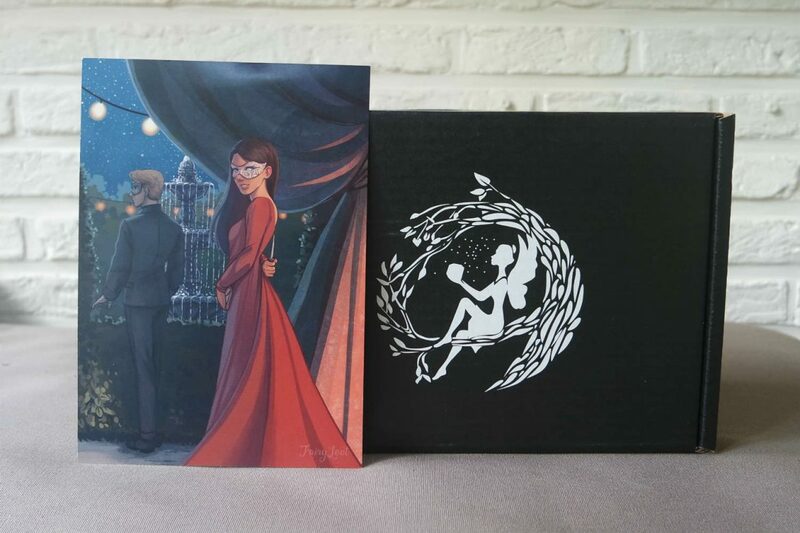 Finally, there were also the traditional goodies: a signed bookplate, a postcard, a letter from the author with artwork of the main characters on the flipside, a bookmark with this month’s artwork and a newsletter. Furthermore, we also got a sampler of Sea Witch (an origin story of the Little Mermaid’s villain) and a little card with a hashtag to find our reading buddies. 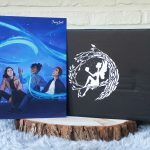 That was all for the Fairyloot June box. While it wasn’t my favourite box ever, it was still a great one. There were plenty of items I’ll gladly use or display as decoration on my shelves and in my living room!